The Hungarian holiday season starts with Advent. Advent wreaths can be seen in stores, schools, offices, and in almost every home. Candles are decorated with red and gold ribbons symbolizing life and brightness. Most children get Advent calendars with a small gift or candy for every day before Christmas. Christmas trees are decorated on Christmas Eve by the family who stays at home to wait for the birth of Christ. Traditional Hungarian folk decorations like Kalocsa embroidery are made into ornaments and dinnerware and more. Read more about Kalocsa here. 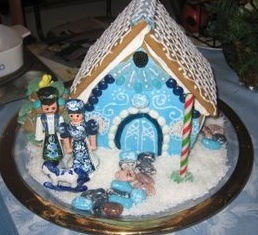 Also, one can make a unique Gingerbread House – a Hungarian Gingerbread house complete with Kalocsa decorations and folks art figurines. Gingerbread Houses are international, so why not get creative and create some amazing Gingerbread Houses based on European or South American etc…decorations and colors. Have Fun!